1. Make a frame using masking tape (or labels like me, if you are out of masking tape!). Make this an appropriate size for the cards you are printing. 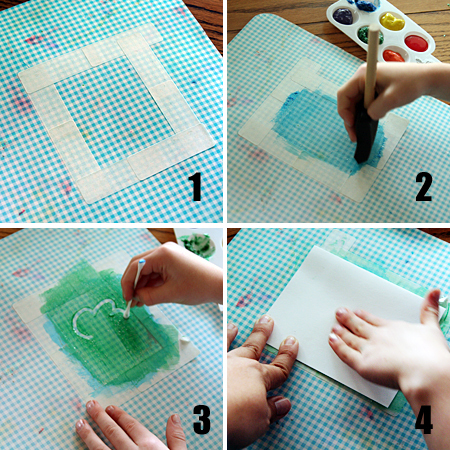 You could do this on a placemat, cookie sheet, or anything else you can wipe paint off of. 2. Paint a smooth layer of paint inside your frame. Foam brushes work great. We used basic washable tempera paint, some with glitter added. 3. Draw a simple design with a Q-tip – Natalie tried hearts, flowers, trees, and birds. Before making our prints, I wiped around the taped-off edge with a paper towel for a clean edge look. 4. Place your card face down and gently rub to make a good print. A grown-up’s hand is helpful to keep the card from slipping around. Pulling up the card and checking out your print is the best — it never gets old! Wipe-off any leftover paint and start again. Great for Mother’s Day, Teacher Appreciation, any occasion really! Bigger prints would look awesome framed on the wall, too….so many ideas! Oooo – love this idea! Can’t wait to try it. Thanks. oh gosh, they’re gorgeous. Such lovely paint colours too! What a fun project, I love this! I’ll be linking. That is a great idea! Thanks for sharing this! Impressive, I’ve never seen anything like this and they are so great!! I LOVE this idea. So simple and it uses stuff we already have. Totally brilliant. Thank you! beautiful!! yay :) ive been waiting for the perfect mother’s day gift idea!! I’d love to know where you got your little paint tray??? It’s so great! Thanks! What a fun and pretty card idea. I’ll have to try this with my kids. I love the look of your new blog, too. I love this idea! I’ll definitely be doing this with the kids! Thank you! We did this today for my son’s teacher, and it turned out great. Thanks! 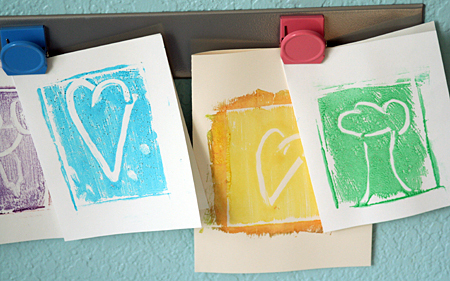 What a wonderful way to do block printing! This looks like a fun project for the kids and I this summer! This looks like it would be a fun summer project. 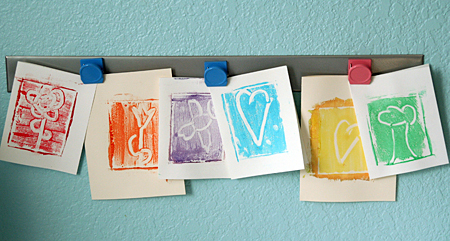 A wonderful way to do block printing! Thanks for this fun idea! My two little ones are very fond of paint and will just love trying out this project. We just did these with our 3 and 5 year old boys as a mother’s day activity. It was GREAT! I agree – – totally addicting. We are already planning our next session, the kids had so much fun. We ran out of watercolor paper (nice and thick) so started using some drawing paper, but they did curl up a bit – so I recommend getting LOTS of watercolor paper. And cutting up into 1/4 sheets so you can double your production. Also, make sure the paint is very thinly applied. Glops and thicker paint tended to mess up the picture when you patted the paper down onto the paint. Thanks for a great idea! Wow! This is fabulous! I might have to try this with my preschool co-op class next year! This is a nice idea — we usually use boards and the children paint on them, but I love the effect of using the q tip to take some paint away. Thanks! We will be trying this one out for sure!Thanks for sharing! These are so pretty! They do look addicting! Thanks for sharing I will try them for sure! !